Gospel singer Emmy Kosgei has been on the news lately for all the negative reasons, the biggest one of all being her husband's affair with one of his church members who he was accused of having s3x with for three months. Despite all these, Emmy Kosgei has decided to be a typical African woman, she seems to have accepted being in a sot of 'polygamous' relationship or as we may call it, she doesn't have a problem her husband banging other women outside as long as she gets her part. The husband family seems to like her alot for that, she is a real woman of substance to them and she has also accepted them and loved them as she waits to inherit all her husband has. Emmy recently shared an intimate moment with her mother-in-law and took pictures which she posted online as she introduced her to the world. Meet my sweet n pretty mother inlaw! 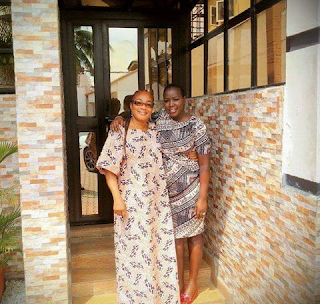 #herroyalty #mamaDmama #madubuko’s God bless her!